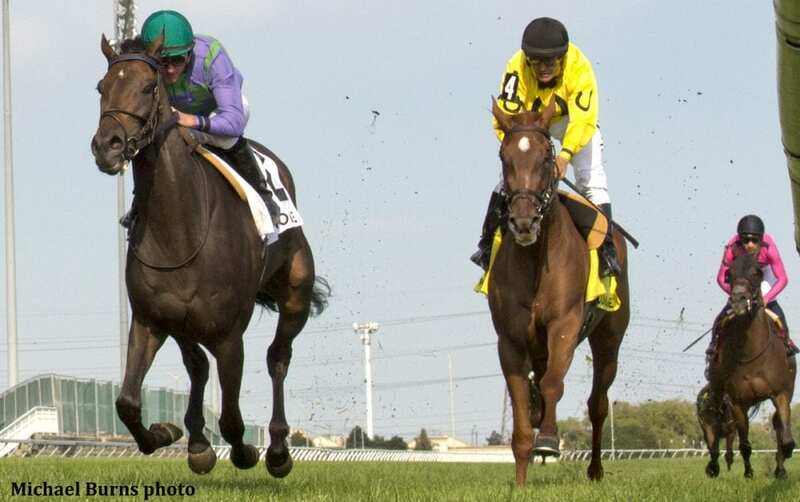 Ivan Dalos' homebred filly Avie's Mineshaft wore down the favored Woodbine Oaks champion, Dixie Moon, in the $225,000 Wonder Where Stakes, third leg of the Triple Tiara for Canadian-foaled three-year-old fillies, on Sunday at Woodbine Racetrack in Toronto, Ontario, Canada. Jockey Gary Boulanger completed a sweep of the Sunday stakes after guiding Decorated Soldier to an upset victory in the Grade 3 Seagram Cup earlier on the program. Making her turf debut in the 1-1/4-mile Canadian classic, the Josie Carroll-trained Avie's Mineshaft trailed the field of five through the first three-quarters in 1:14.95 before Boulanger made his move. “I had a relatively easy trip; she broke good and I was just saving ground waiting,” said Boulanger. While he was waiting, Dixie Moon raced in between front-runners Double Latte and Glamanation, but took back and charged outside to take the lead in the final turn when Avie's Mineshaft launched her attack. The favorite had a three-length advantage through the stretch before Avie's Mineshaft stole the spotlight in the final 1/16th, rallying by to win in 2:03.67 by 1-1/4 lengths. Avie's Mineshaft was the 5-1 second choice and paid $12.20 to win after just missing in the Bison City middle leg won by Safe to Say, who finished back in third today. Double Latte and Glamanation were fourth and fifth, respectively. Avie's Mineshaft now sports a record reading 2-3-1 in eight starts and nearly doubled her bankroll, which climbed over $275,000. Her prior starts, all on Woodbine's Tapeta surface, have included a close second-place finish in last year's Princess Elizabeth Stakes, a third-place finish in the Fury Stakes and a pair of Grade 3 fourth-place finishes in the Mazarine and Selene. Bred in Ontario by Dalos' Tall Oaks Farm, Avie's Mineshaft is by Mineshaft out of Avie's Empire. It was a good day for Dalos as he watched the filly's half-brother Avie's Flatter make a successful career debut at Woodbine in the second race. Avie's Mineshaft and Dixie Moon combined for a 2-4 exacta worth $21.80. The 2-4-1 trifecta paid $21.95 and the superfecta of 2-4-1-3 returned $77.80 for $1 tickets. Live Thoroughbred racing continues at Woodbine on Wednesday evening (August 15). First race post time is 6:45 p.m. This entry was posted in Racing and tagged avie's mineshaft, dixie moon, gary boulanger, Ivan Dalos, josie carroll, wonder where stakes, woodbine by Press Release. Bookmark the permalink.